Granular Synthesis was first conceptualized by David Gabor in 1946 with its first implementations by Iannis Xennakis in 1959. It took decades for the first realtime implementations by Curtis Roads in 1988. Since the 1970’s granular synthesis has become a basic building block of our synthetic aural/audio landscape much in the same way that frequency modulation and tape manipulation techniques have. There has been substantial developments in granular synthesis that have led to an increasing number of flavors of granular synthesis led by people like Curtis Roads, Kim Cascone and Barry Truax, to name a few. With synchronous, asynchronous, clouds, granular specialization, realtime, time-thrashing and a myriad of other techniques it has become a versatile and diverse language of approaches and sounds. What sets Bell Granular Synthesis apart from other methods is the implementation of spectral process that manage pitch information in what is called a FakeCoder (it is essentially a vocoder without LPC), a physical modeled resonating body and realtime manipulation for grain envelopes/shapes. The FakeCoder was initially implemented in 2003 while studying Linear Predictive Coding and phase vocoder. In a response to the noise art of the time, it was decided to work with harmonic sounds and complex timbres and drop strictly enharmonic sounds. The FakeCoder assumes that every sound is harmonic, reproducing only the sustained periods of harmonic sounds, with no noise based articulation. The FakeCoder estimates a fundamental frequency and then tracks the envelopes of each of the harmonics in series of the sound. The result is an imperfect, yet, sung version of a sound. The tracking can be stored in tables. This imperfect representation abstracts the original sound source that still has clear reference to the original. Elements of rhythm, timbral characteristics are all still discernible. The new synthesized will work well in conjunction with the original, blurring the line between acoustic and electronic sounds, allowing for a copacetic blending of colors. The technique has further developed to create 1) Prong~, a fundamental unit to Bell Granular Synthesis and 2) Essence Synthesis, a second generation FakeCoder that includes the implementation of non-noisey enharmonic sounds. The idea of creating a physical modeled body filter became a side development of the FakeCoder. The work was inspired by Perry Cook‘s research on physical model that led to a two-part development of a light-weight-physical-modeling synthesizer named Es PM Synth and a body resonator, BodyFilters. With these simple parameters, sounds of strings, brass and winds can be emulated, as well as other more synthetic sounds. Essentially these parameters emulate the shape, size, material and thickness of a resonating body. prong~, and in correspondence granular bell synthesis, takes an opposite approach to the first granular system, which were based on oscillators. The first process for each audio signal that is subjected to bell granular synthesis is first fed through a subtractive synthesizer. 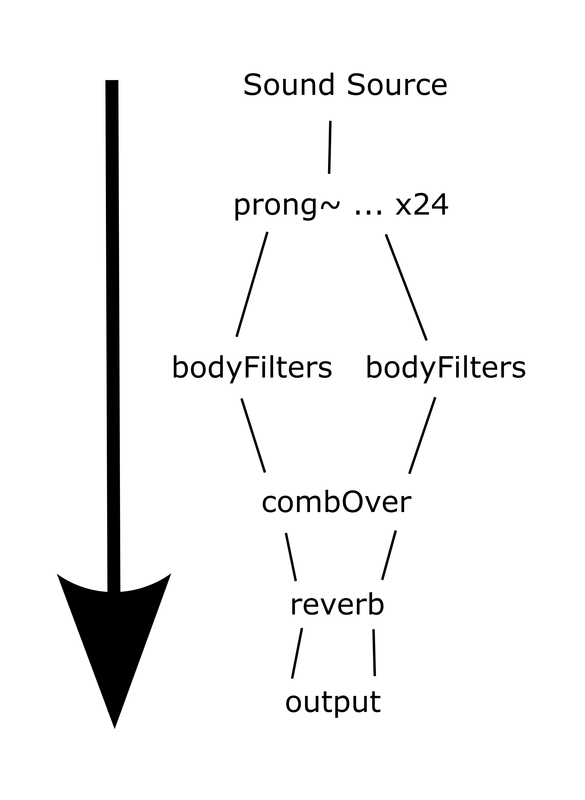 prong~ is developed from the FakeCoder and BodyFilters. Each prong has spectral properties that are malleable. These are the same control concepts and values as the Bodyfilters; spectral skew, spectral parity, spectral tilt, spectral angle, spectral emphasis, Q and fundamental. Each sound that enters the synthesizer can be manipulated by taking the initial color of the sound that is then run through a subtractive synthesizer. This, like the FakeCoder, gives a sense of connection between the original signal and the output, though not being the same. The use of subtractive synthesis gives a complex and varied sound that can also be a live manipulation. After the sound has been striated through the bandpass filters, the sound is then fed to a delay line. The delay line. This allows for time-thrashing, a form of realtime granular synthesis where a sound is manipulated in the time domain before being granulated. Each prong~ has its own delay line, allowing for a time to have the perception of disintegrating in time. There has been the addition of a tunable (in frequency), modulating resonant filter on each grain. This allows for a even wider color pallet for grains, as well as a possibility to sustain sounds. 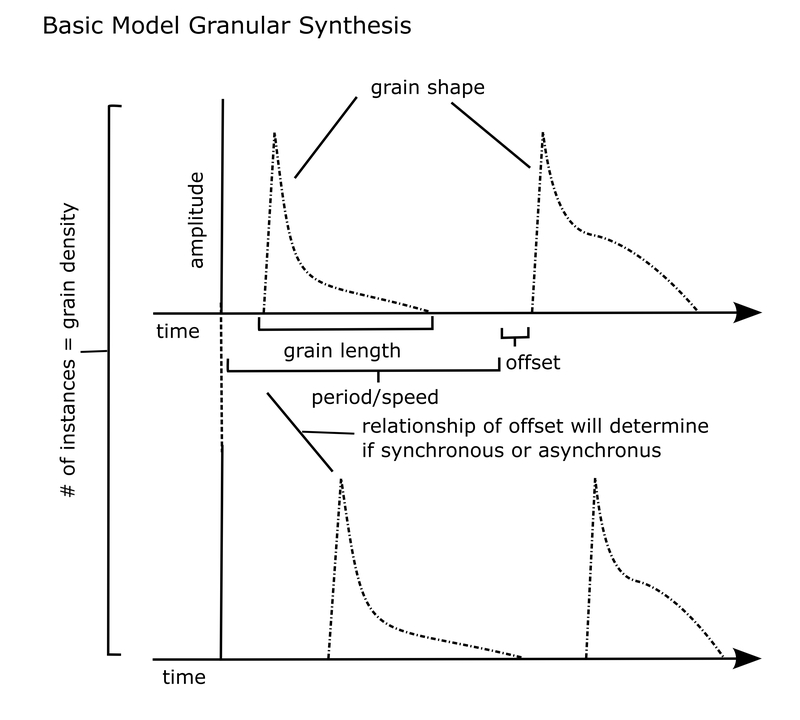 The shape of a grain (envelope) is a very powerful timbral consideration in granulate synthesis. Often granular synthesis techniques give standard window shapes such as hanning, hamming, exp decay/attack windows and the likes. It is fair to say that this limits the timbral range possible, particularly if there is no way of mutating from shape to shape and only allowing for discrete changes in grain shape. This led to a method of mutating from one grain shape to another. The decision was to start with two simple shapes; hanning and exponential (attack and decay since they are similar in principle). Early implementations of the mutation between these two window types quickly let to a very diverse and dynamic color palate that was not available in any other standard window shape. It also allowed for a life cycle of grain shape, which my research had not come across before. Through experimentation it was discovered that multiple cycles per grain period created even more complex sounds, as well as allowing for the implication of having more grains per second (up to 5000 grains per grain per period, allowing for a total of 240,000 grains implied per period, with only using the CPU usage for 24). There are a few very simple implementations in the whole process that need to be mentioned. To emulate the sound of harmonics, there is an implementation of series and parallel comb filters. Simply, the comb filters are tuned an octave above the given pitch, when triggered they emulate the sound of harmonics. Reverb is also used to add a sense of space. The following diagram demonstrates the signal-flow of Bell Granular Synthesis. The inevitable problem, like all granular synthesizers is still controllability. This issue was tackled in the development of the Strombaphone and is discussed in some of its documentation.